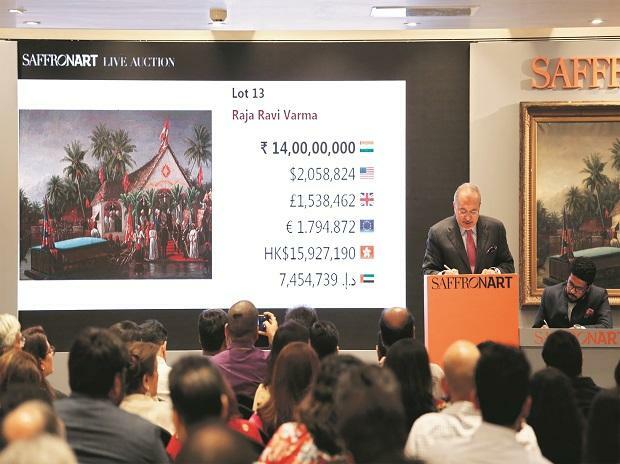 Despite an objection filed by fugitive Nirav Modi’s company Camelot Enterprises, leading Indian art auction house Saffronart went right ahead and auctioned 68 lots of art for sale at its Spring Live Auction on Monday evening in Mumbai. The catalogue, which was estimated to generate between Rs 30 crore and Rs 50 crore, did better with net sales of Rs 55 crore that will go to the tax authorities. 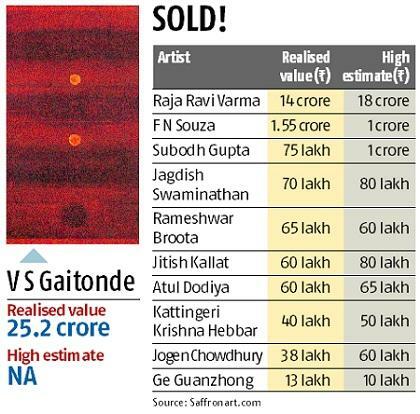 Of the 68 works, 55 were sold, Saffronart representatives say. The art was auctioned in a bid to recover around Rs 96 crore due from Camelot Enterprises, one of the dozens of subsidiaries and shell companies Nirav was operating, according to a sale notice on the website of the income-tax department in Mumbai. Dinesh Vazirani, who heads SaffronArt, was also the auctioneer for the event and presented Nirav’s seized collection to an audience of around 100 people, amidst a plushly decorated hall featuring marbled floors and designer furniture, and emulated an ambience eerily similar to Nirav’s Kamala Mills office, with good reason - the art on the walls was all his. As the auction for the evening proceeded, the sales started briskly with the second painting in the catalogue, a Jogen Chowdhury selling for Rs 46 lakh much higher than the projected high estimate of Rs18 lakhs. A few lots later, a 1955 ink on paper work by F N Souza, who was one of Nirav’s favorite artists, sold for Rs 32 lakhs and almost two and a half times the high estimate of Rs12 lakhs. The buyer? A caller from London. While a few paintings went higher than a crore, the highlight of the evening was 60 inches x 40 inches 1973 oil on canvas by V S Gaitonde that netted Rs 22 crore. Earlier, there had been some conjecture as to whether the paintings would be able to fetch serious buyers. But clearly that was not a concern for the bigger, better known works. “If someone is helping to preserve the collection of art rather than leave it to be destroyed then that’s a positive, because no matter what kind of money was used to buy the art, it wasn’t created with dishonourable intent,” says Rakhi Sarkar, founder-director of CIMA Art Gallery. Her point is that if it wasn’t auctioned, the odds of it getting destroyed and not being maintained or looked after would be high. Other artworks sold included works by F N Souza, K Laxma Goud, Akbar Padamsee, Reena Kallat, Atul Dodiya, Sunil Padwal, Gurcharan Singh, and H A Gade. The authorities had invited six auction houses to submit tenders for the auction and four participated. Those included Pundole’s, Christie’s India, AstaGuru, and Saffronart. Saffronart was selected. For Nirav, buying authentic art was one way of establishing his credibility in elite social circles. On March 19, Nirav Modi, who was absconding for over a year, was finally spotted and then arrested in London on behalf of the Indian authorities where a court denied him bail and remanded him in custody till March 29. It remains to be seen if he will be extradited in the near future.